While Remy Ma's career has been the definition of an uphill battle, plagued by some of life's harshest realities such as serving jail time and suffering a miscarriage, she is starting to see for herself how the view is always worth the climb. After serving a six-year prison stint and putting in some serious work to pick up where her career left off, the Bronx native is finally getting what's rightfully hers. As the 37-year-old reclaims her title as one of the best rappers in the game, she is celebrating today (Nov. 8) with the release of her highly anticipated collaboration with Lil' Kim, "Wake Me Up." Remy, who is currently readying her sophomore album, Seven Winters, Six Summers, stopped by REVOLT's studio in Los Angeles to reflect on what she considers to be some of her favorites, ranging from highlights of her own career to the best part of working with the iconic Lil' Kim. Real Talk | Remy Ma reveals four of her "favorites"
"My best line? Like ever? Oh gosh, I mean I'm just so nice, like where do I start?" Remy says with a laugh. "There's just so many of them. I can't really think of my best, I have a lot of things I've said that I like but I'm going to go with my favorite, probably is, "Wish I could bring Pun back/ b—h run that, b—h run that." The line in question appears in the Funkmaster Flex's posse cut "Ante Up (Remix)," with Teflon, Busta Rhymes and M.O.P. also blessing the track. From there Remy dives into her favorite song she's ever made, something that isn't an easy decision to make on the fly considering her decade-long career. "My best Remy song, that I made? I like, it's off of my first album, There's Something About Remy, and it's called 'Crazy,'" she says. "It's my favorite song because I feel like it's so me. It's so, like how I was really feeling at that moment and how I grew up and how I just looked at the world and how I thought about things. Whenever I listen to it, I be like, 'Oh Thank God I'm not that crazy person anymore.' It was one of my more heartfelt moments that I just let everything pour out on the record." The conversation then touches on what Remy feels is the best feeling in the world, with her selection of "unconditional love" and someone having your back no matter what making for a perfect segue into discussing her recent collaboration with Lil' Kim. "The best part of my collab with Lil' Kim… first of all of the parts are the best," Remy says. "She's just so humble and so down to the earth. I think my favorite favorite favorite is when the beat first drops and she just comes on, like, 'Unhh' After that, it's just like chills. Best part, hands down." 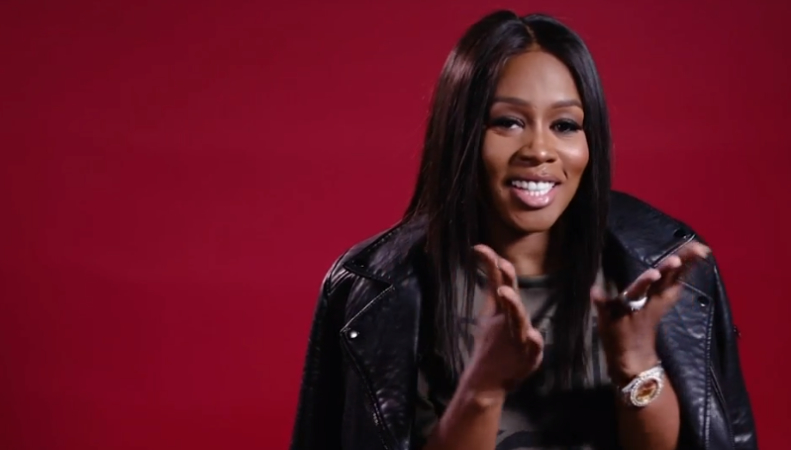 Check out Remy Ma's edition of "Real Talk" with REVOLT in the exclusive video above.